Cloud-based and embedded within Microsoft Dynamics NAV and D365 Business Central, ReadSoft Online from Kofax enables your customers to capture, extract and verify all invoice data automatically—all directly from the same Dynamics interface they use every day. Implementation takes as little as 10 minutes for your customers. Flexible pricing models allow for annual (1- 5 yrs), monthly or pre-paid click volume to accomodate buying preferences. Partners! 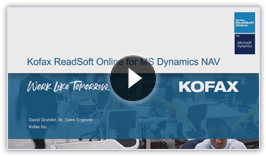 Kofax provides world-class Partner Benefits for NAV/D365 Partners who help customers deploy ReadSoft Online for Microsoft Dynamics NAV and D365 Business Central as part of their AP Automation efforts.